The latest, most innovative hair coloring and styles. Personalized creativity for every client. 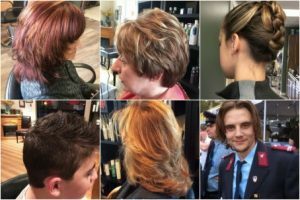 20% OFF Referal Bonus – Refer a new client to LaSpina Renewed Image Salon and get 20% OFF of your next Hair Styling or Coloring AND 20% OFF for the new clients first Hair Styling or Coloring service! We stock a complete wig selection for all your needs. It has always been our practice to utilize the world’s first and only color and bleach developer system made with natural organic plant enzymes…no matter what line of hair coloring we use on our clients. When mixed with any permanent or demi-permanent hair color, our developers open the cuticle layers of the hair and carry the color molecules faster and deeper into the cortex. The result is longer lasting and vibrant color results while significantly reducing peroxide and color damage. Hair looks and feels as it should, like real hair, instead of straw.